Mark Twain was an American humorist, satirist, novelist, writer, and lecturer who had stayed in Weggis in Summer of 1897. Samuel Langhorne Clemens, born on November 30, 1835 in Florida, Missouri, and died on April 21, 1910 in Redding, Connecticut, was better known by his pen name Mark Twain. Mark Twain was the writer of the famous The Adventures of Tom Sawyer, The Adventures of Huckleberry Finn, and The Prince and the Pauper novels. He also wrote A Tramp Abroad, his journey through central and southern Europe. This is the book, in Chapter XXVIII [The Jodel and Its Native Wilds], where he mentioned about Weggis (spelled Waeggis at the book) and Rigi Mountain (Rigi-Kulm). In Mark Twain: A Biography authored by Albert Bigelow Paine, you will find what Mark Twain wrote about Weggis, in Chapter 198 entitled A Summer in Switzerland. This is the charmingest place we have ever lived in for repose and restfulness, superb scenery whose beauty undergoes a perpetual change from one miracle to another, yet never runs short of fresh surprises and new inventions. We shall always come here for the summers if we can. 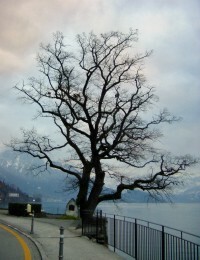 The others have climbed the Rigi, he says, and he expects to some day if Twichell will come and climb it with him. They had climbed it together during that summer vagabondage, nineteen years before. In honor of Mark Twain, a monument was built under the oak tree where he was usually sitting during his 2 months stay in Weggis in Summer of 1897. In one way or another, aside from being visited by famous people, Weggis became popular because of what he said about the place.